On February 21, the US District Court for the Eastern District of Michigan dismissed the lawsuit filed by the ADA. Judge Sean F. Cox ruled in favor of IHS, ruling that ADA did not have standing or a viable legal claim. 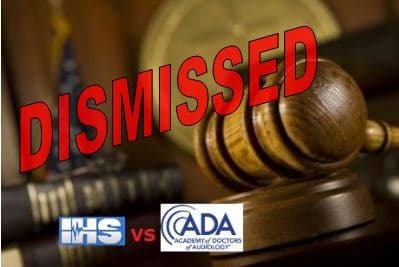 According to IHS and first reported by the Hearing Review, “the Court concluded that ADA could not allege that any statement that IHS would make in the Certificates would be false or misleading. The Court recognized that most states are silent on whether hearing aid specialists can provide tinnitus management or not, but that silence is not construed as a prohibition. The Hearing Review reached out to ADA executive director, Stephanie Czuhajewski , who provided the following statement, “While ADA is disappointed with the court’s decision and disagrees with it, we remain committed to protecting audiology’s scope of practice and the public.” ADA members will be holding a virtual town hall on March 6th to discuss the court’s decision and other related matters. At State conferences, on more than one occasion, I have seen presentations on tinnitus treatment by researchers and practitioners. When an audience of 150 or more audiologists is asked “who is interested in providing these services?” you can count the affirmatives on one hand. It also is apparent that since at best <5% of audiologists are interested in managing tinnitus symptoms they are less qualified than anyone off the street that takes an active interest in well established methods and protocols (not just hearing aids). Audiologists should either step up or get out of the way. You can’t extrapolate data based on how many audiologists “raised their hand” at a random state conference. According to the BLS there are over 13,000 audiologists in the U.S. alone, and unless you have actual data on tinnitus services provided, then you’re just making up random facts to support your opinion.